The UK's number one comparison site analysed over 13 million car insurance quotes run on the site over 12 months, and of the nation's top 35 favourite car brands it found Subaru drivers make the fewest number of claims for motor accidents, followed by Smart Car and Fiat drivers. In fact, Subaru drivers are less likely to be younger drivers, and more likely to be in their thirties and forties and insuring the popular Impreza model. With lower claims rates than other models this indicates that Impreza owner are in fact careful about looking after their prized wheels. Peter Harrison, car insurance expert at MoneySupermarket, said: "A turn up for the motoring books! The Subaru is shedding its image of a car for pure petrol heads, and is actually being driven by older, safer drivers instead of the 'drive it like they stole it' younger motoring generation. "Interestingly, though, the fact that Subaru drivers are least likely to make a claim, doesn't directly translate into them paying the cheapest premiums. While claims are one factor insurers take into account when setting premium prices, other factors also play a part. These include the engine size, the number of miles you clock up, where you park, and your profession amongst other things. Smaller cars are generally cheaper to insure as the cost of repairs and parts are likely to be lower than those on more premium models. If you want to pay less for car insurance, it is worth considering these factors when choosing your motor as this will help reduce the overall cost of running a car." Neil Greig, director of policy at The Institute of Advanced Motorists, said: "Noisy hatchbacks done up in dubious taste might not be easy on the eye but they are often looked after with tender love and care by their doting owners. From Audi to Volvo the best drivers take care of their driving and their cars because they know crashes will cost them in terms of higher premiums and ultimately second hand value." The research also unearthed the nation's claims calamities. Analysis of car brands reveals drivers of the Spanish made Seat, Korean built Kia and British produced Mini take the top spots for most likely to make a claim for an 'at fault' motor accident. Also featuring in the top five are drivers behind the wheel of other Japanese brands Honda and Mazda. Pete Harrison continued: "Being involved in a motor accident, however severe and whether you are at fault or not, can be a very traumatic and costly experience. Claiming for either an 'at fault' or 'not at fault' accident will have an impact on the cost of your car insurance premiums. Our research shows the average claim value for an 'at fault' accident is £3,025, and these types of claims represent more than half of all those registered on the site. "Whether you own a Subaru or a Seat, it is worth remembering that car insurance prices vary considerably, so it is important to shop around and get the best deal that meets your requirement." Further analysis of the data reveals where in the UK the most accidents take place.3 The Watford area leads the charge, closely followed by commuter town Hemel Hempstead, Chelmsford, St Albans and Enfield named as being hotspots for accident claims. 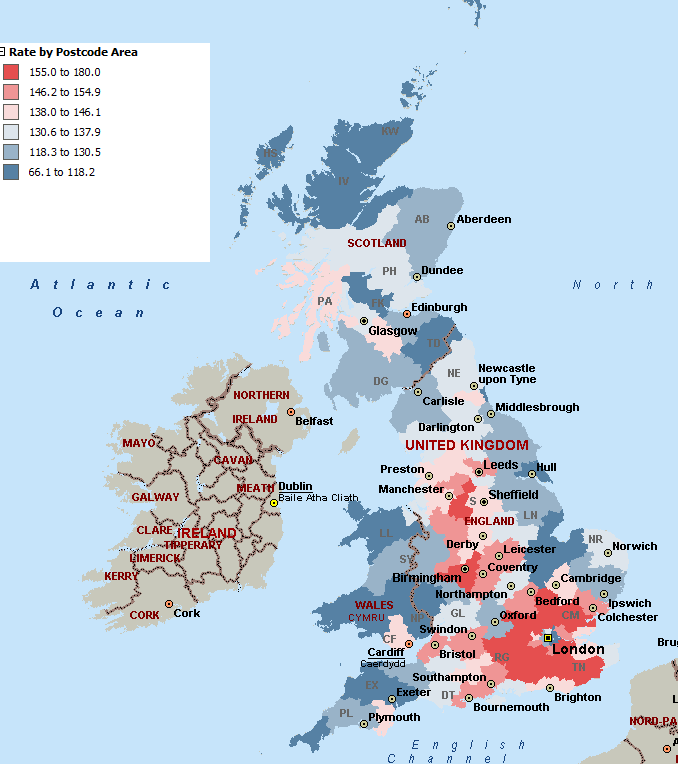 Drivers in urban areas Hull and East London make the fewest claims, as do drivers in Welsh community Llandrindod Wells, Cornish City Truro, and Scottish town Falkirk. Pete Harrison concluded: "Living in a commuter town like Watford or Hemel Hempstead will have an impact on the level of the car insurance premium you will pay. Heavily congested areas, particularly around key commuter routes such as Greater London mean statistically you are more likely to make a claim. Regardless of whether motorists are making the most of an open motorway, or are bumper to bumper on the daily commute, they should always be vigilant of their own driving and that of those around them. "Even if an accident isn't your fault, and you make a claim on another driver's insurance policy, your own premiums can still go up. All accidents you are involved in must be reported to your insurer, whether or not they were caused by you. If you've recently been involved in an accident, your provider will assess you as being more likely to be in an accident in the future and will push up your premiums at renewal, making it essential to shop around for a better deal at renewal time." 1 13.4 million quotes run on the MoneySupermarket car insurance site between 1 July 2012 to 30 June 2013. 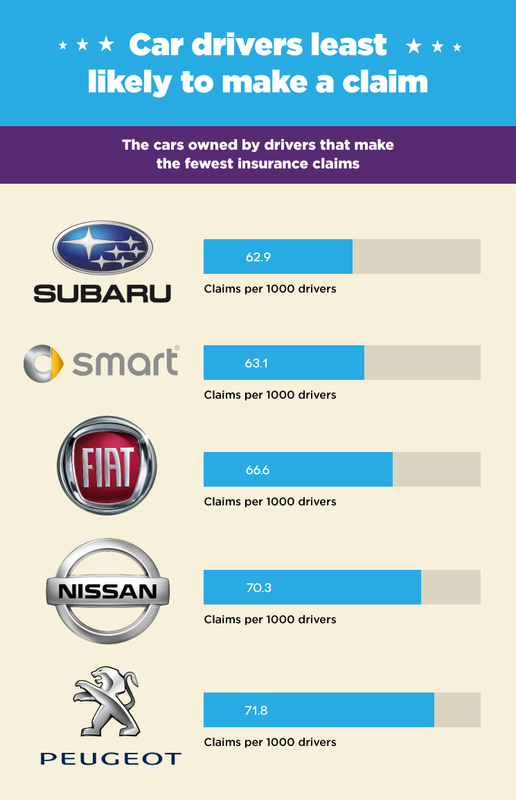 The claims are based on the five year claims history for each driver.